Vortex Viper Long Range Shooting xlr-6-24 review by Scott Austin - A great scope at a great price! Exaggerations aside, the last ten years have seen a plethora of great quality, mission-dedicated scopes emerge on the scene. If you haven’t shopped for a scope recently you’re really doing yourself a disfavor. The clarity and brightness due to improved lens coatings alone, in the last decade or so, is simply remarkable. I know it sounds like a cliché but you’ve really “got to see it to believe it”. Comparing scopes is best done close to twilight. This gives you an accurate assessment as to what each scope can do at the most optimal time you would most likely be pursuing game. I used to be one of those leuprovskiforce fans until I read a review (Can you spell “hypocrite”?) on Vortex’s Viper line. After comparing the optics and features with the Vortex to a number of other scopes I am now the proud zealot/owner of a Viper PST 1-4×24 and a Viper HS LR 6-24×50 FFP. Both are tank-like built, feature-packed scopes with “razor’s-edge” sharp optics that put all of my other high end scopes to shame, however the HS LR 6-24×50 literally has me selling other scopes and guns to buy more. Folks, this is serious! I’ve never been so enamored with the capabilities and results I’ve achieved with this particular scope over any other. Besides having the first focal plane feature (FFP), which allows for accurate ranging at any magnification, as well as extra-low dispersion (XD) glass, this scope has the revolutionary laser-etched XLR reticle, which is the most capable, intuitive long range scope I’ve ever used. There’s no more messing with knobs (although it has this capability as well if you like) or bullet drop compensators that don’t always replicate your specific ballistic data. Forget the “spoon and sprocket” (or something like that) reticles with hash marks that merely get you “close” to where you wish your bullet would impact. When hunting, close just doesn’t cut it. Neither is it fair to the game. 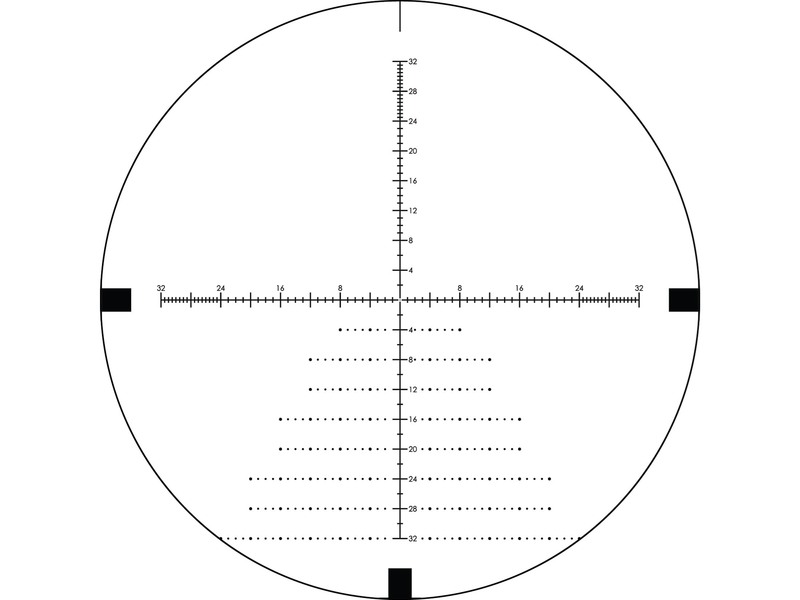 “The XLR reticle has simple minute of angle (MOA) subtensions for both elevation and windage which allows for accurate, repeatable results every time. The fact that you’re utilizing very specific aiming points within the reticle for your holdovers as opposed to turning knobs makes you far more stealthy in the field. In the past it was like yelling, “Hey! Yo antelope! I’m over here adjusting knobs! See my hands?” Now it’s range the distance, read the data card on the rifle, place the appropriate moa hash mark on the target (don’t forget to compensate for the wind), press the trigger, crank up the barbecue. One of the potential problems in dabbling with those pesky turrets is the fact that you’re dependent on one extra layer of mechanical liability. Consistency in accuracy can only be achieved by doing the same thing, the same way, every time. I currently have one high-end scope in my safe, which needs to be sent back to the manufacturer because the elevation turret decided to take a vacation. Fortunately it occurred when my quarry was just a paper target. The point is, the XLR reticle stays independent of further manipulation during the firing process. This to me is a huge asset. For many years I used a scope with a mil dot reticle. This scope was considered to be the best of the best (even our most elite forces praise its attributes), however I never quite got used to fractionalizing the mil dots for a precise hold. In other words, holding ¾ of a mil was just not very intuitive. With the XLR reticle, I have very precise aiming points, which leave nothing to the imagination. Even though I am completely sold on the concept of the XLR reticle, my curiosity got the best of me. I had to check the repeatability of Vortex’s turrets. Were they really as good as everyone was claiming? Last week I took a couple of friends to the range to test out the HS LR on my Tikka Continental .300 Win. Mag. out to 720yards (which is the furthest target I had access to) the turrets tracked precisely with the reticle. I was sold. Return the turret back to “0” and I was good to go again. Did I mention that Vortex has incorporated a very positive CRS zero stop system so you always have an established reference as to where you’re at? A couple of weeks ago I got burned on this very point while instructing a client because the scope I was utilizing did not have this critical feature. He fired two shots at the 600 yard plate only to hear a very resounding “silence”. His look of bewilderment forced me to show him how it’s done. Not! A clean miss. I checked with one of the other instructors who advised me that I was probably “one full rotation from an accurate hit”. Is that like “one bean short of a three bean salad”? Not to digress but this didn’t make us look very professional. With Vortex’s CRS zero stop feature this problem becomes a thing of the past. Back to looking good! 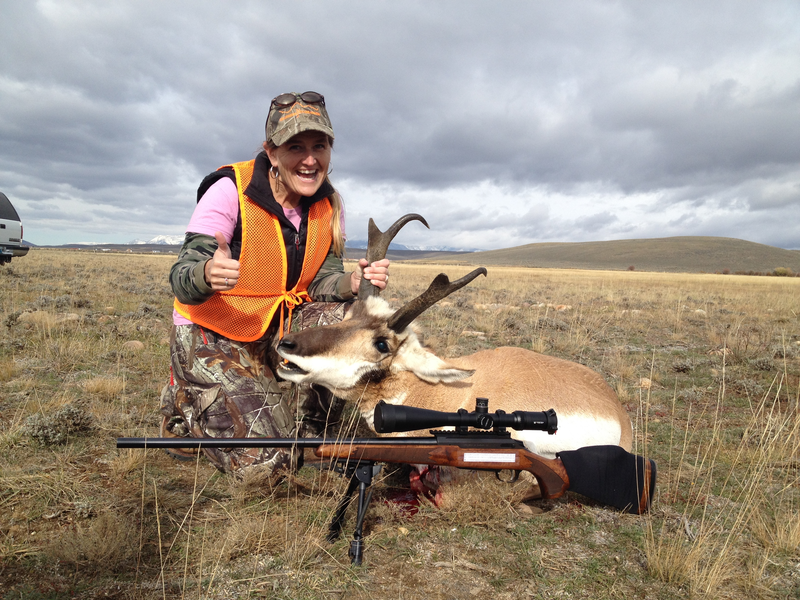 If you’re shooting a light-recoiling rifle (varmints anyone?) whereas you can see your bullet impact, measuring the distance from target to impact and then compensating is a snap with the XLR reticle. This is a very fast, intuitive system. Have you ever been frustrated with helping a buddy make wind calls? This is where this reticle really shines. Match the HS LR scope with Vortex’s Razor spotting scope. 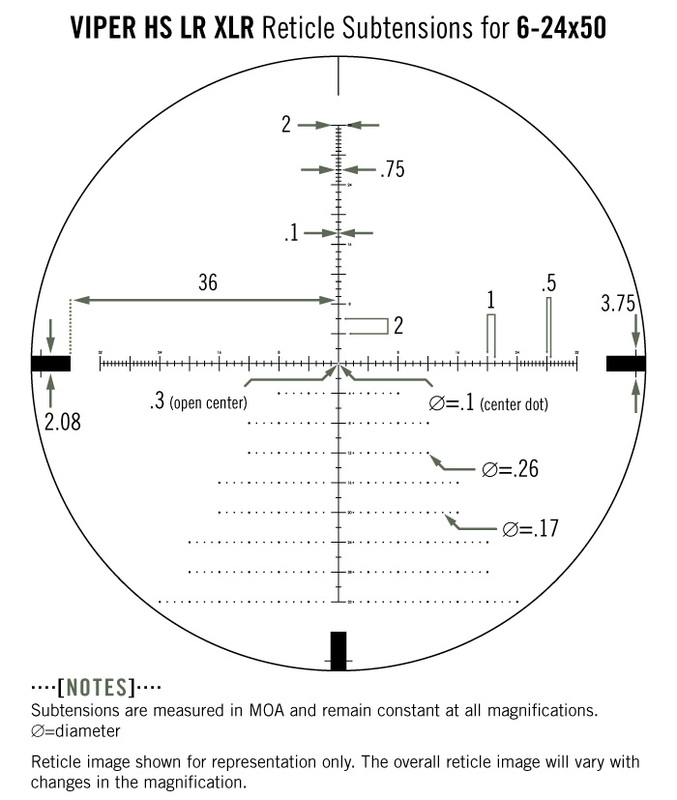 Install the optional 30X WA ranging reticle, which is calibrated in either MOA or MRAD subtensions and voila, you’re both speaking the same language. No longer are you telling your buddy to hold on the tan color rock just left of the Charlie Brown Christmas tree. Your spotter will have the capability of calling out accurate and precise measurements to ensure hits time after time. Within a couple of months of owning this scope I have recommended this scope to numerous people at the range and had three friends purchase this scope after seeing mine in action. I have two more friends who are currently saving their pennies for one. Jackson Hole Shooting Experience purchased one after taking a look at mine and are very happy with it. My savings is going to one more scope and their Razor spotting scope with the ranging reticle. It would be wonderful if Vortex offered the XLR reticle in their Diamondback and Viper spotting scopes as well. buy a Viper HERE. Proof is in the pudding. 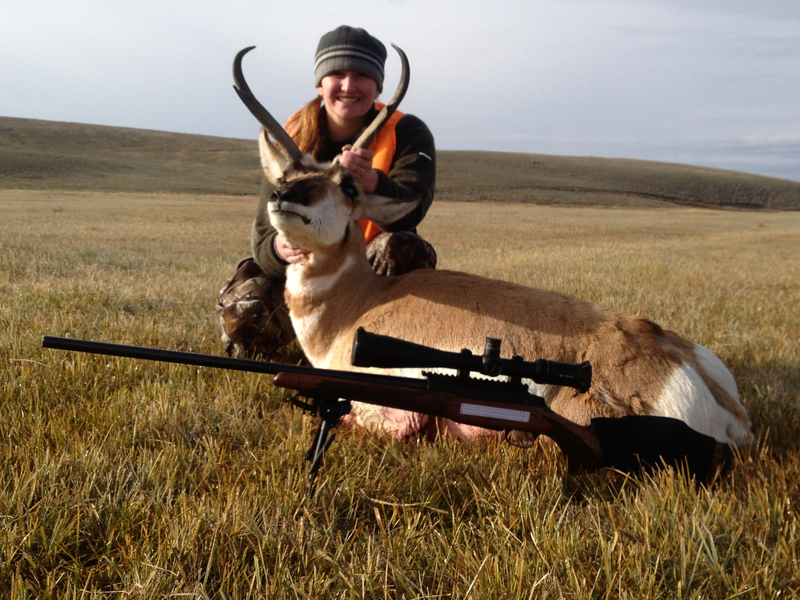 This Fall my wife and daughter both utilized this scope on the Tikka .300 to harvest their antelope at 350 and 250 yards respectively. Both were one-shot kills placed precisely where they aimed. Both used the XLR reticle as opposed to adjusting the turrets. Ready to buy your own Viper? Check out this great deal! About the Vortex Viper XLR 6-24 Review by Scott Austin author: “Range Junkie” Scott Austin is a lifelong hunter and sports shooter. He resides in Jackson Hole Wyoming where he serves as Dean of Students at the JH Bible college and moonlights as a Nomad Rifleman shooting instructor with the Jackson Hole Shooting Experience. Learn more about Scott and his partners at JHSE HERE.